Hair fall is a common issue faced by both men and women. Due to various factors, hair fall can occur even in teenagers and adults. Hair fall is a natural process and each day a certain amount of hair fall off and new hair strands grow in place of lost hair. In some cases, the hair follicles may get weak and this prevents the growth of new hair strands. On the long run, the hair becomes thin and weak causing major hair fall problems. 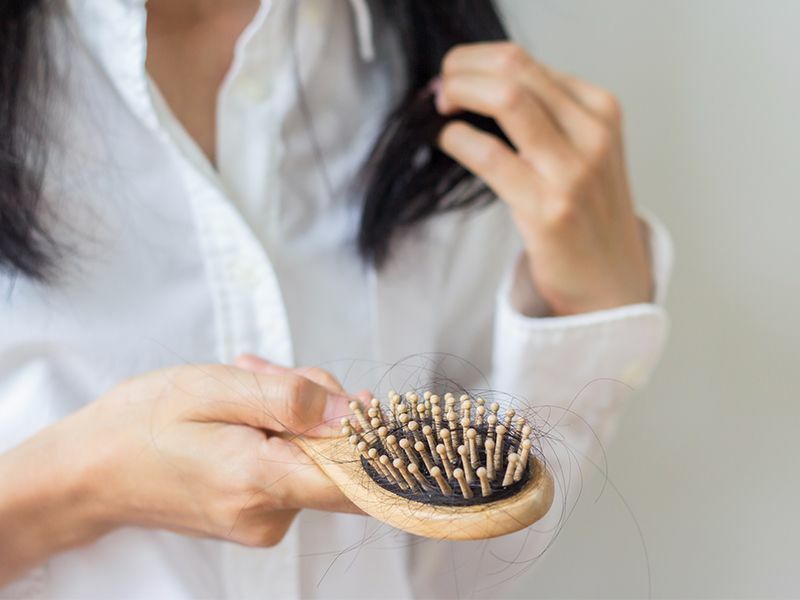 Numerous factors including stress, tension, anger, anxiety, unhygienic scalp, dandruff, infections and inadequate nutrition can lead to hair loss. An improper diet including high intake of fried foods, spicy, salty, and fermented foods, high tea and coffee consumptions, excessive consumption of alcohol and meat can lead to the aggravation of Pitta Dosha in the body. This can lead to the accumulation of dead skin cells in the scalp causing hair fall. Excess use of hair styling agent also accounts for hair loss as they are composed of harsh chemicals. If not used in moderate amounts, these chemicals can damage the hair follicles and prevent hair growth. Hormonal imbalance is also considered as a cause for hair fall in women. Irregular washing and cleaning of hair can cause accumulation of dirt on the scalp and weaken the hair roots causing severe hair fall. All these factors increase the risk of hair loss and also interfere with the growth of new hair strands from the hair follicle. According to Ayurveda, early hair loss is connected to body type and the imbalance of the body doshas. At Ayur Bethaniya Ayurveda Hospital, we believe in identifying the root cause of hair fall and treating the cause completely and removing the imbalance of mind and body. The treatment plan includes pacifying Pitta and Vata doshas through the combination of herbal medicines, oils, massage, and a customised diet plan and few lifestyle modifications. Special combination of herbs is used to produce hair growth promoting oils and hair packs that stimulate the hair follicles to grow new hair, cleanse and cools the scalp and remove the impurities from the scalp. Along with the treatment plan, yoga is also instructed to improve the blood circulation in the scalp and to balance the body system. Along with the treatment plan, diet and lifestyle modification are also included to promote overall well being. This includes avoiding spicy, greasy, hot foods and incorporating high nutritive value fibre-rich foods, salads, fruits, and lentils. Washing your hair regularly and massaging the scalp using herbal oils prevent the accumulation of dead scalp cells and prevent hair loss to a great extent. Minimizing stress and anxiety level help pacify the doshas and balance the system. At Ayur Bethaniya Ayurveda Hospital, we provide safe and effective Ayurvedic treatment plans that are customized as per individual patient condition to reduce hair fall and to promote hair growth. To know more about hair fall treatment plans and treatment cost, book an appointment now.